Vintage Leaf Memories - Michael Langlois: Do the Maple Leafs have an identity? What does it need to be? Do the Maple Leafs have an identity? What does it need to be? I know a lot of words get tossed around when discussing sports teams, especially when they win something: you know, we attribute terms like character, determination, a "never-say-day" attitude, etc. to successful teams. We also often talk in terms of a particular group of players being an “offensive team”, “defensively responsible”, a “come-from-behind team”, or a “group that never quits”. I guess what I’m getting at is, most good teams have, or at least over time develop what we call an identity. It’s perhaps a bit of an over-used term, but I believe it has some meaning. I accept that even some championship teams did not necessarily have a particular “identity”. But for me, there is something to the idea that a good “team”, as a collective unit, has or at least over time builds something special together—a spirit, a togetherness that manifests itself not only in that sense of strong camaraderie, but also in the way they play. Teams who feel—and believe—that they have a unique identity, something particular to them as a group, tend to fight hard to play to that identity because they have earned the designation in the minds of the media, their fans- and maybe in their own minds, as well. Again, it shows itself by the traits or characteristics that we, as fans and observers, can’t help but notice. It is demonstrated in comments such as “you don’t want to go up against that team right now, they are playing with so much heart…” or “I hope we don’t face those guys in the playoffs, because they’re so hard to play against”. That’s usually code (in fact, it’s more than code, it’s pretty direct) for: those guys are good, and there is something a bit different about them. They are either tough, physical, aggressive, determined—pick a word. But at the end of the day, they (those good teams with an identity) generally hate to lose and more often than not, find a way to win. You could see that in those great Montreal teams in the 1950s, ‘60s and ‘70s. When I was a young hockey fan in that era and observing their success very closely, I sometimes felt as though they hated losing even more than they liked winning. 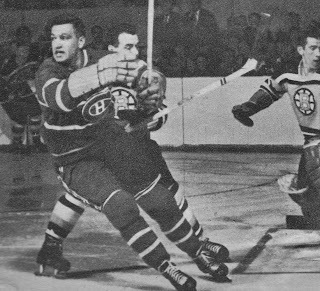 Individuals like Rocket Richard, Doug Harvey, Dickie Moore, "Boom Boom" Geoffrion (Geoffrion is shown in late 1950s action against Don Simmons and the Bruins, above left), Jean Beliveau, Henri Richard and then Serge Savard, Guy Lafleur, Jacque Lemaire, Larry Robinson and Ken Dryden were intensely proud of their team's success- and they were surrounded by teammates who cared as deeply as the "superstars" did. Of course, talent wins, too, but we see year after year in the playoffs that talent alone doesn’t do it. Otherwise, the Canucks would have won by now, or maybe the Sharks, too. This all leads me to our own situation with the Leafs. Years into Burke’s make-over, we are indisputably better than we were four years ago, at least in my mind. (We are not as far along as I think we should be, but that's a debate for another day...) Our system is certainly stocked with, in overall terms, better players—at least more players who have a shot at playing (and playing well) some day in the NHL. But though Burke used a lot of words in his early years with the organization (truculence and all that), just what are the Maple Leafs right now? Do they have an identity? If so, how would you define or describe that identity? I realize that I ask this question at the very time that a new coach is taking over for his first full season behind the bench, and at a time when some new, younger faces may be in the line-up come early next season. They are clearly a work in progress. But I think it’s fair to ask the question. And if we do not, for example, have a firmly entrenched identity right now, what is it shaping up to be? What does Carlyle want it to be? And given our roster reality (and yes, recognizing some additions/deletions are of course entirely likely by the time the season starts), what are we right now? And here’s my last question for the day: for those of you who have been following this franchise for years, and have bled blue and white for some time, can you think back to a time when the Leafs had a certain quality that was worth being defined within the context of having a particular “identity”? I lied. One more question: if you could describe it in a few words, what, to be really successful in the next few years, do you think the current Leaf team has to become, in terms of their on-ice identity? I think a common quality in all great teams - and maybe in all great athletes - is one you've mentioned: they hate to lose. In hockey, what's required is team leadership from a core of players who've got that quality, who'll do whatever it takes to win. Inevitably, other players will draw inspiration from them, and it becomes a collective mentality. You could see that in the Kings through their late season and playoff run, as the most recent example. It's the quality missing from the current Leaf roster. Without it, no coaching change will make much of a difference. I think the Leafs had a bit of an identity under Wilson: a fast-skating, run and gun team that didn't play very much defence. Right now, I think the team is a bit of an enigma. Phaneuf is their captain, but I don't think the team draws their identity from him in the way that they did with Wendel Clark, Roberts, Gilmour or somebody like the Kings do with Dustin Brown or the Caps do with Kessel is quiet so the team really doesn't feed off his personality. Grabovski with his speed and energy might be the closest thing to a player on the Leafs that gives it an identity. In thier most recent successes, in the Sundin/ Roberts era I would characterize the Leafs identity as Senator killers: work the whole year to get into the playoffs and do anyting to beat the Senators. Think of this, in the 2001 playoffs Ottawa did not score their first goal of the series until 16:51 of the third period in the third game! In order to succeed, the current Leafs need to change. I am hoping they keep the speed game, but they need to play better defence. This is what Carlyle is working on now, you could see it on the ice and in his few comments about Wilson when Carlyle refered to Beauchemin's poor defensive play on coming back from the Leafs. The Leafs also need to get tougher to play against. In the past battles against Ottawa, the old Leafs had some talent with grit in Roberts, Steve Thomas and Darcy Tucker. Among the less talented Gary Vauk, Shanye Corson, even Domi was tough to play against. Who among the current Leafs could rise up to the compete level of the old Leafs/Senators playoff games? I think Dion Phaneuf...and despite his limitations...that is why he is the captain. At times Grabovski can compete at that level, we saw this best in the Boston game against Chara. Mike Brown can compete but he has little talent. Those current Leaf team could also use some Joseph/Belfour level goaltending from Reimer/Scrivens. That's a really good breakdown, DP. They were becoming a certain kind of team under Wilson, for sure. Now....? As hard as he usually plays, I wonder if the team could ever really follow Grabbo? I think your comments on Dion are very fair. There is a "the price of admission" required to simply contend. No point in being determined, never quitting, hating to lose etc without the requisite skill level to compete. Moving beyond the qualifiers my choice, considering the era the game is in, would be "dominate defensive team". It is difficult to put away a strong defensive team. When their scorers get hot they are unbeatable, when their scoring cools off they are still in every game. As the game has become lower scoring the ability to be among the upper echelon in playing today's game is critical. Maybe in 7 or 10 years it will be different. From '75-'92 the average age of a defenseman was under 26. This was reflected in terrible defensive performance. Dominant offensive teams won. If you didn't have a guy (or three) at the top of the scoring race forget hoisting the Grail. Today if you are a top quality defensive team , both ends of the ice, nobody gets to let up against you and teams fear making a mistake. To fall behind is lethal. In short such a team puts the opposition off their game and is a team nobody wants to play. LA and Boston are examples as to what quality defensive teams can do in the current NHL. BUT you gotta have an elite goalie or an elite defenseman. My choice would be the elite, shut-down defenseman, 25 minutes a night of shut down! That is the kind of player one builds a dominate defensive team around. The Leafs don't have such a player. There isn't a basket load of these guys around. Even the existing Norris Trophy holder isn't on such a list. Too many giveaways, not much PK ice time, very little TOI against top lines. Karlsson is a special player but he is nowhere near being a shutdown guy. 'cause their ain't one in the organization. With all respect to the potential of Jake G. he will never be an elite shut down guy. As with Karlsson there is too much Phil Housely and not enough Shea Weber in him. DOMINATE DEFENSIVE TEAM. On the plus side the Leafs have the coach for it and are building the requisite defensive depth. I was nodding along as I read your post, Bmaximus. Good stuff. Those who visit here a fair bit know I wanted the Leafs to draft a defenseman this summer, and I'm glad they did. You need a lot of depth on "D". And if we're talking about adding a piece, and only one, my preference, like yours, is for a true shutdown guy on the back end. Thanks for your comment on Gardiner. I've tried to make that point here a few times. Extremely talented young guy, but I wonder if he will ever be physical enough to be that guy you look down the bench at crunch time in the playoffs. Now, if he developers like Niedermayer, maybe, eh? But even Niedermayer had some push in his game, though he was so sweetly skilled. What I would love to see is a team that owns the ACC. If nothing else make playing the Leafs in Toronto a miserable experience. Too often we see teams come in here all pumped up to play in front of friends and family. They push the Leafs and there is rarely the amount of push back that you would expect when someone comes into your house and has their way with you. No matter what you do on the road, no matter how bad you are, please make the opposition treat Toronto as a place they would rather not be. It is a start and I think that it is important. It could become a catalyst for better things. I think that's a great point, cbh747. It's been a while since we can say we "owned" the ACC. The fact that a lot of visiting players have friends and family on hand is nice and all that, but should never trump the fact that the entire Leaf roster is protecting their own turf every time they set foot on the ice in Toronto. That should be a mis-match, every time, if this team is built properly. "As hard as he usually plays, I wonder if the team could ever really follow Grabbo?" It depends on who else is playing in Toronto. Grabbo does have the "A", right? So you know what the coaches think. If Grabbo adds another 10 to 15 points to his yearly totals...in three years with his work ethic, better english, age and veteran status...I could see it. Lidstrom, Alfredson, Patrice Bergeron, Saku Koivu, Jonathan Toews...none of these are in your face but just quietly lead by example on the ice. One reason that I was happy to see Randy Carlyle hired as coach is that he is a professional coach with a pro's attitude. His predecessor, in my opinion, was not. If the Leafs become a solid professional team under Carlyle, they will be tough defensively and competent on offence. They will play well on special teams, especially killing penalties, and they will not beat themselves. In other words, they will play like pros. I am really looking forward to a full season with Carlyle in charge. I expect the Leafs to be far more consistent and a much tougher team to play. They will become more professional. Attitude and professionalism are always important, and can well be part of a team's "identity". Good to hear from you, BCLeafFan. Stay in touch. I absolutely agree that a term like "identity" can be over-used but still retain a meaningful concept at it's core. Some teams find it by happy accident, others work hard towards it through clearly communicated organisational strategies that are lived by everyone from front office to the ice rather than distributed as token gestures. Sir Peter Blake, who competed in and directed multiple Around the World Yacht Race campaigns was famous in the strategy community for a particular anecdote. Having just employed a new receptionist for a race campaign, he greeted her on her first day, sat her down before she started her duties of answering phones and greeting guests and said: "This is how you are going to make my boat go faster." There are a couple of (also) over-used terms in corporate philosophy which have relevance to this discussion "Vision" and "Mission". A company should only have one Vision statement because its purpose is to unify, inspire and present an aspirational goal. Mission statements are about the "how", the verbs describing what needs to be done to bring the Vision about. Thus, it makes sense for teams within a company to have different Mission statements as they all do slightly different things day to day. In our discussion, when you say "identity", I think you are referring to "vision" given my definitions above, and I think you're right that our Leafs have been missing one for some time. For me, as it is for some others who have commented above, it would need to be about speed: anything else and we would either have to massively rework the roster or simply have the wrong players to make good on our vision. And players who don't understand how what they do contributes to making the boat go faster will paint their nails between calls rather than be energised and cough up their discretionary effort to the greater good. To this end, I'd be interested to hear from folk who know hockey far better than I: surely it's not the case that defensive responsibility and speed are mutually exclusive strategies? It seems to be an assumption around the boards that you're one type of team or the other. But, for your forwards at least, surely speed is something that can applied effectively on defense as much as big bodies back checking? After all force = mass x ACCELERATION, so surely speedy forwards can contribute to back checking as much as those big bodies? Speed is what the Leafs "were"- will they still be that under Carlyle? At least a somewhat more structured offensive team, with defensive intensity? These are some of the questions we can ponder in these summer months. While these are quiet days and the discussion here not as intense as it is sometimes, perhaps others can respond to your final point/question. For my part, I believe that yes, speed and defensive accountability can go hand in hand. Great topic, Michael. As long as I have watched hockey, the identity, or the on-ice identity, of a team requires winning hockey to begin with, and then the identity is defined the best players of the team. In the early-to-mid-90's Clark and Gilmour were the foremost guys who gave the Leafs their their identity, they were the faces of the franchise. Hard-working, great hockey players who could not be intimidated; Gilmour was strong in every aspect of the game despite not being physically big. And he always gave as good as he got. Meanwhile, Wendel was downright menacing. They both displayed, or rather oozed, the kind of spirit and determination behind which the whole team would rally. Nowadays, maybe the "how" of it more easily defines a team's identity, rather than the "who" of it. Find your winning game, and the face(s) of a franchise will surface sooner or later. Which, in turn, brings me to the point KiwiLeaf eloquently pointed out; which is speed. That is a beneficial trait our roster actually does have. Obviously, it was not used optimally under Wilson. His idea seemed to mainly be moving the puck to whoever was the highest skating guy on the ice at any given moment, it doesn't take a genius to figure it out defencively. And the Leafs, under Wilson, were constantly undone by turnovers directly caused by such a predictable style of attack. You can actually use speed a bit more creatively than that, by not always being in such a hurry to make the opening pass, and giving your speedy forwards up there some time to use their ability to find the open ice, meanwhile playing the puck backwards if you need to. And the same goes for defence; when the opposition gets the puck, use that speed to get your five on the ice to such positions that they can limit the optimal passing lanes available for the other team. That kind of play has been, for me, a big part of the identity of the Red Wings for at least as long as Babcock has been the coach there, and consequently the players who have thrived under that system have risen as the faces of the franchise. So I guess my conclusion is, after a long-winded breakdown, that I personally don't so much think team identity so much as a factor in being succesful, as I feel it's a result of success and consistency. The Red Wing example os a good one, for sure.